It was because of an Uber driver on my way to Sydney airport that I’d ended up in such strange circumstances in India. My driver Vic came from an offbeat community in Punjab and took great interest in my planned expedition to India. Brimming with confidence, my faith rested in a print off itinerary which claimed to uncover all the ‘local secrets.’ It instilled an unfounded self-belief that I’d venture away from the tourist trail. Vic wasn’t as convinced about the daringness of the plans. Over the course of our hour-long ride together Vic politely argued that I was skimming the surface of a deeply complex place. Rigidity is a westernised concept, and to truly experience India I had to wholeheartedly submit to its raw unpredictability. He wasn’t callous, but his advice stung. He’d pierced through the impenetrable wall of my baseless self-assurance. Kind-heartedly he offered a solution. Vic extended an invitation to see his home and its rural community surrounds. My first step in embracing the impulsiveness of India, I accepted. Worryingly my phone had died on the train. The last message I received from Vic read to get off at Beas station to be picked up. By who? I wasn’t sure. It was a last-minute change from my original destination of Amritsar over an hour away. I began to doubt whether it was wise to trust some driver who I barely knew. But with no better alternatives, I jumped off as instructed at the riverfront station. Night had fallen, and the hazy station was deserted. After the screeches of the train gallivanting onwards had dissipated, there wasn’t so much as a pin drop of sound. With my enormous bag in tow I waited on the platform floor hunched over with my head buried into my hands. Thankfully my dejection over the dusty station floor was short-lived. A burly lonesome figure grabbed my shoulder and pulled me off the ground. He shook my hand and offered to take one of my bags. Quite frantically the man who I assumed to be a friend or relative of Vic’s gestured toward his car. He hurriedly threw my bags in the boot and patted the passenger seat inviting me inside. Against any rational inclination I had, I brainlessly followed. Our drive through the Punjabi plains began, our communication limited to friendly waves and smiles. The vehicle throttled over dirt roads which had moon craters for potholes. Every turbulent bump catapulted us into the roof. Yet there was an indescribable calm over this arcadian landscape. There were no street lights, or big buildings only grassy farming fields and wandering livestock. It was an escape from the relentless sensory excess of India’s megacities. The only disruption to the countryside’s calmness was my anonymous acquaintances relentless car horn beeping. His style of driving reflected India’s lawless every vehicle for themselves policy. Our seatbeltless car frantically skidded in and out of oncoming traffic showing a total contempt for order. My wobbling arm tightly clutched the roof handle until we’d finally reached our destination, Mari Buchian. Mari Buchian is a small village of five-thousand people. 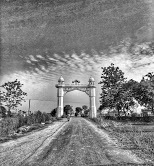 It’s fifty kilometres away from its miniscule local district headquarters of Batala. Mari Buchian’s centrepiece is its local Sikh temple which bellows prayer calls at dusk and dawn. In the village centre aloof cows chomped on gutter scraps, and stray dogs rested in rubble heaps. Illuminated in the darkness, a crackling fire on the curb revealed the deeply lined faces of several skinny old men. They huddled together, smoking and loudly cackling at each other’s jokes. Eventually we came to a stop in front of an imposing iron clad gate. It fronted a decadent Indian home. With butterflies in my stomach, I couldn’t have been any more apprehensive. Though whatever I was about to confront was surely less treacherous than driving in the car. Hesitantly I stepped out to see a mammoth of a man charge toward me with open arms. His bear paw hands affectionally squeezed the air from my lungs in a warm embrace. This man was Vic’s father, Binder. Unable to speak English, he physically communicated a loving kindness that’s reserved for family. In an instant Binder’s warmth had lulled my nerves. Not a moment after being released from his tight grasp, Vic’s vast and confusing Sikh familial lineage introduced themselves. Amidst all this commotion my railway station pickup jetted off. His rustic car clunked and unhealthily grinded its way back toward the treacherous dirt roads on which we came. I was led inside for a midnight feast of juicy chicken wings, liver, and metallic tasting kidneys. Not wanting to offend my new hosts I crunched on every last scrap of food, gnawing on the cartilage just as they did. This was all washed down with a smoky scotch that was as potent as industrial paint thinner. Over dinner Binder the familial matriarch broadcasted his families background and spoke about Mari Buchian’s history. All men in the family were military servicemen, except for his youngest who was being groomed to obtain a tertiary education. This young boy was the interpreter that bridged our language divide. It was odd having a child translate the often very adult nature of his father’s conversations. Though where he could Binder would interject showing off his English prowess. Brazenly on the topic of cricket he puffed his chest and brazenly said “Ricky Pointing’s” with a big thumbs up. I gave him an equally enthusiastic thumbs up about Australia’s cricket captain from a decade ago. Though the women of the home were confined to having very different aspirations. Possibly the most contentious cultural divide between our Western and Eastern ideologies was the enforcement of domesticated gender roles. The women in the home were purposefully uneducated and were confined to domestic duties. Any attempt I made at putting away a plate or glass resulted in my hand being slapped away. The family belonged to a high caste but lived in a region with the largest concentration of the depressed caste nationally. Most villagers are economically disadvantaged and survive on wheat harvests. Punjab may be nicknamed the ‘bread basket’ for its large farming output but many inhabitants still live below the poverty line. According to Binder no westerners had ventured through Mari Buchian’s gates since the violent Khalistan secessionist movement in the seventies. I’d bucked the trend and was well on my way to delving into the underbelly of Indian culture which Vic had challenged me to see. Mari Buchian isn’t a destination that’s dreamt of by starry eyed travellers. It’s not a place that’s laminated for postcards or featured on travel websites. Mari Buchian is a tiny fragment of the wider ugliness, beauty, mystery, and allure of rural India. Mari Buchian is one of the many towns that emanates the hinterlands soul. The soul of India which travellers desperately try to find.